It was jatre (fair) day at Ramanagaram on 4th April 2009. The Sri Rama Brahma Ratotsava took place with grandeur and gaiety. 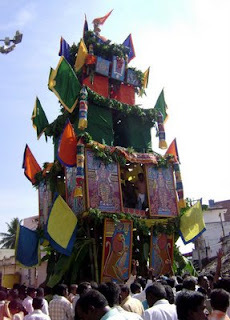 The 50 feet long Chariot with Sri Rama idol along with his consort Seetha, Lakshmana and Hanumantha moved precariously on the narrow streets of Ramanagaram. Thousands of devotees across the district had darshan of Lord Rama and seeked his blessings. All along the chariot route many associations, individuals arranged ‘aravatige’ (a shed on road side in which water, butter-milk are distributed gratis).